Ok so when i first heard about this stuff i had to have some. 15 calories for 28 grams of protein? yes please. 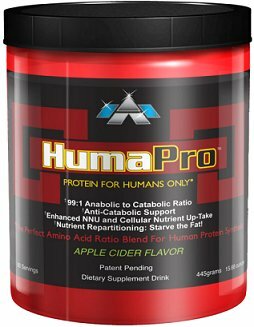 I have used Humapro two times in the past.I decided to go with it as my primary protein for Superhero Ripped transformation. The concept with ALR Industries humapro is not a new one. Its a protein that is 99 percent bio-available. Which means you take in 100 grams worth you get 99 grams of protein utilized to muscle tissues. Some say whey, soy and rice protein are only 60 percent bio-available if high grade. Much of the cheaper proteins are far from high grade. Why not just eat meat or beans for protein The argument there is that meat, legumes or anything you eat with protein in it will lose much of its content by the time it digest. lol what?! you think so. yes i think so. I know that when i used it over the GNC or ON protein i had been using i lost body fat and gained muscle rapidly the only change was my protein. The second time i tried humapro was during my shakeology transformation last year. I slacked on my training reducing my cardio and lifting days to 2 or 3 days a week. The combination let me drop almost 20 pounds and increase my lean mass by quite a bit. How does it mix? It doesn’t shake as much as you want it won’t fully mix. Hope you found this review of Humapro helpful.